One of my favorite things to do in the kitchen is cook and prepare meals for my family to enjoy. Actually let me say that is my second most favorite thing to do in the kitchen. The first thing would be eating and enjoying home cooked meals with my family. Over the years I have experimented with many different recipes and various cooking styles. Some have been failures, while others were just so so and the rest have usually become family favorites. They varied from my famous hot chicken wings, carrot-apple-honey bread, stuffed Italian turkey breasts, scallops ala bordelaise, and many many more. Lately I have been experimenting with soups and stews. 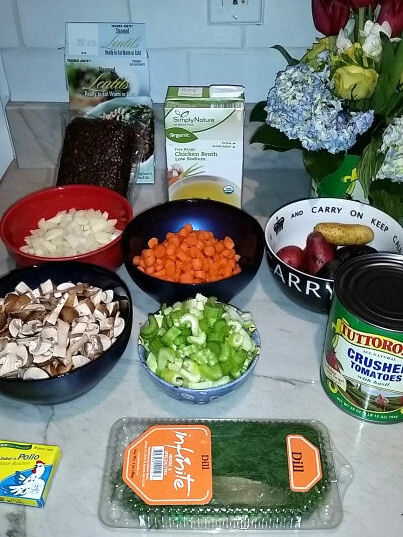 I wanted to come up with a nice vegetarian soup that was high in nutrients and protein. This particular soup origination came from a trip to my local Trader Joes. While I was perusing the vegetable and salad aisle I came across a container of fresh ready to eat lentils. I started the soup out with two liters of low sodium vegetable stock. Try to stick with low-sodium stocks and broths for your soup. Most of the regular versions have over 1000 mg of sodium per serving. That is a tremendous amount of salt and in my opinion cannot be too good for you. I would rather add salt to taste that way I can control my sodium intake. After heating up the vegetable stock I add a cup of cubed or sliced carrots and a cup of sliced celery. Trader Joes sells a convenient pack with pre-cubed carrots, celery and onions. I then take an onion and basically puree it in my chopper. This is then added to the soup. I also add several bay leaves, pepper, cumin, tarragon, season-salt and sometimes some oregano. At this point I also take some finely chopped garlic (from the jar) and basil (also from a jar). Then I add a large can or cubed tomatoes to the mix. 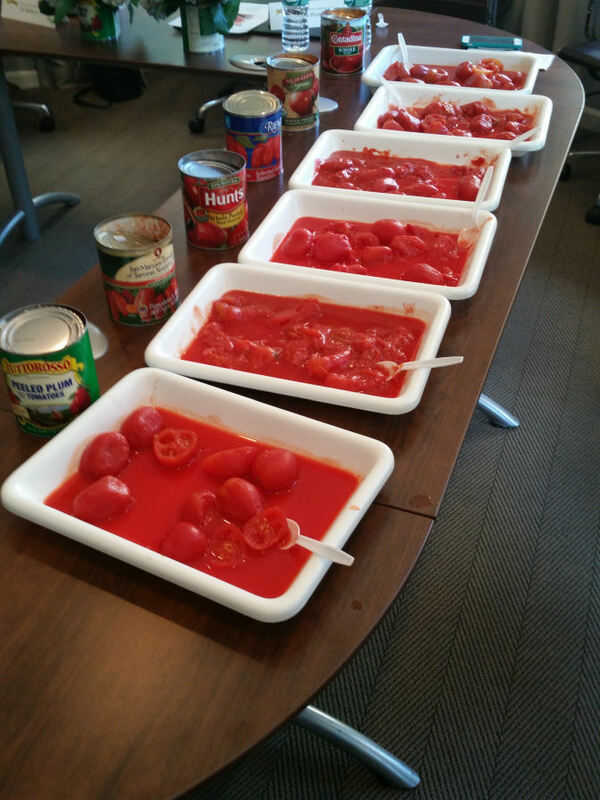 I recently was at tomato tasting event where I got to taste 6 different canned whole tomatoes right out of the can, like Hunts, San Marzano, Contadina, Tuttorosso, Muir Glen Organic and Rienzi. I have to tell you I wasn’t impressed with most of them by the look. Most of them were not even whole and broken into pieces. Most tasted like a burnt tin. Yuk. Although the event was sponsored by Tuttorosso, my top 2 picks from the brands above is Muir Glen and Tuttorosso. They both taste very good on the similar level. While all of this is simmering I fry up some chopped mushrooms, onions, garlic and olive oil in a pan. At the same time in a different pot I boil about 7-8 tiny gourmet potatoes. I really like the purple and red ones. I also slice up some baby carrots and add them to the simmering soup. After the garlic, mushrooms and onions have browned nicely I add them to the soup as well. 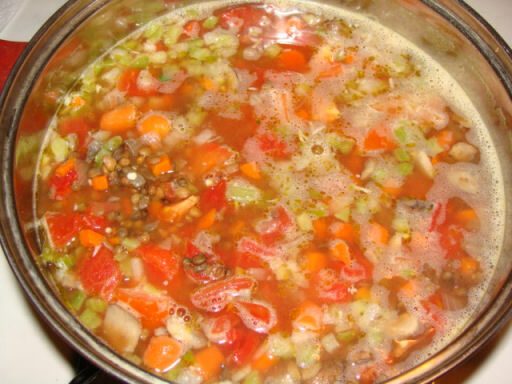 This give the soup a nice added flavor and the cooked mushrooms are a very nice addition. At this point I am usually running out of room in the soup pot so I remove some of the liquid and transfer it to a smaller pot. Remember I have to make some room for the potatoes. After cooking the potatoes for about 15 minutes or so I take them out of the pots and slice them into small pieces. They are then ready to add to the soup. Now at this point I add the lentils to the soup stirring them around in the mix. Then the soup is reduced to a simmer and I let it sit for about 1 to 1.5 hours. After this time I check the taste to see if it needs any more salt or pepper. It usually does so I add some little by little until it tastes just about right. Then it is ready to be served. 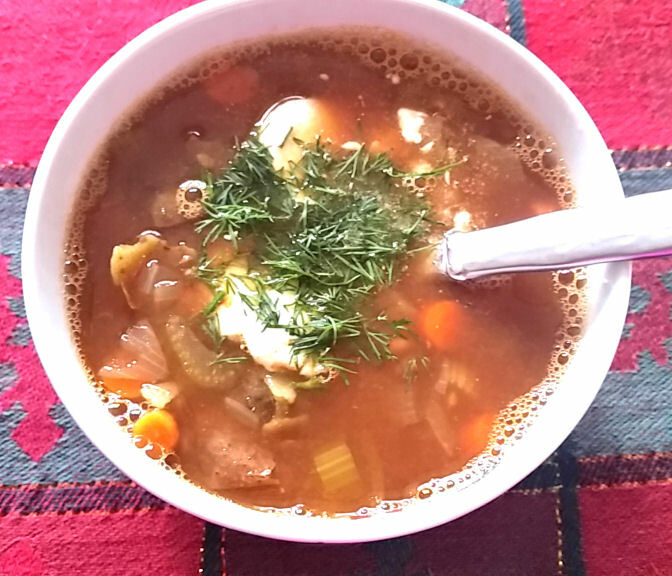 This is a great hearty soup to enjoy on those cold winter days. It goes great with some fresh whole-wheat buttered bread and crackers. For a non-vegetarian version you can add pieces of cooked chicken to the soup before serving. Cooking time 1.5 to 2 hours. 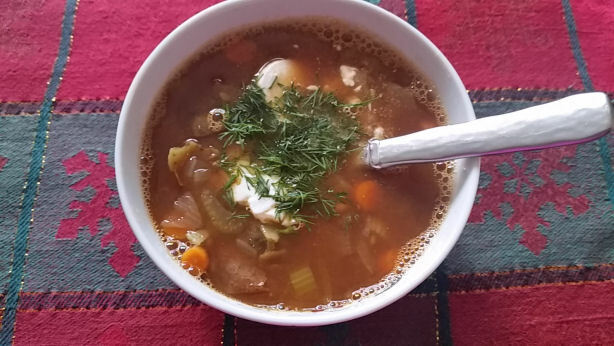 If you liked this soup recipe, check out the Russian Borsh Soup recipe. Do you have a good source for lentils? Please share in a comment below. Thanks and have a great week! This soup looks amazing ! With mushrooms being my favorite, make me want to make the soup now. This is great for the upcoming cold weather we will be having soon. This soup looks fantastic, I will try it this fall/winter on a cold day! That looks super good. I love soup and this is the perfect weather for it. We got our first snowfall in NY 2 days ago. oh my gosh this looks amazing especially when its 10 degrees outside. Thank you for sharing! This is an amazing soup. It is so cold outside that a good hearty soup is what I love to make and have for dinner. I like your wonderful recipe. That has my mouth watering. What did you top the soup off with? Tarragon? Rosemary? Oh that looks so good! I love lentil soup! I have not tried to make it at home before though…I am going to have to give this a try! I really want to try to learn some soups this winter!!! I would make homemade spaghetti it is my favorite. with meaty sauce with all those tomato’s. I would make vegetable beef soup. I love salsa and spaghetti. My DIL law loves my lasagna so it would be hard to narrow it down to one recipe. I like to make any kind of vegetable soup. Homeade pasta sauces are great too! I would make a minestrone soup! I’d make beef macaroni soup!! I would make a hearty minestrone. a good chili or stew! I would make turkey chili! I’d make my sauce recipe! It simmers all day and makes the whole house smell delicious. I would make spagetti, and probably chili..I love chili in the winter! I would make penne alla vodka! Best brand for all sauces!!! Thanks for the chance! I would the items in the Tuttorosso giftpack to make a cooked pasta dish I throw together…with tomato sauce, paste, and some oregano and basil…it is would be delicious. I would make some delicious lasagna and also some spaghetti sauce with this great gift pack. Thanks! I would like to win and make some salsa with this great Tuttorosso gift pack. Very nice – our family really likes tomatoes! Lasagna is always a winner. I think I would make sauce for spaghetti or some other pasta dish. I think I would make some vegetarian chilli. Tell me – What recipe would you make using the items in Tuttorosso giftpack? I would make mac and cheese with the tomatoes. I would make my Grandma’s three-meats spaghetti sauce! I’d make my favorite pasta sauce by Marcella Hazan. The simplest and most delicious sauce made with only 3-4 ingredients: tomatoes, butter and an onion. Yum! I commented and shared the post “I Said Hello and Welcome to New Keurig 2.0 Brewing System”. Actually, my hubby would do the cooking and he would make an amazing sauce with meatballs. I would make chili and spaghetti sauce. I would make spaghetti sauce. I would add some Italian sausage and some meatballs!!! Thanks so much, Irina! What a treat this is. Merry Christmas! I just won the Big Apple Mama recent Tuttoroso Giveaway. Lots of goodies in it….tomato sauce, chopped tomatoes, tomato paste, whole tomatoes, a nice apron, a tote bag and a great wooden spoon for creating my next batch of Marcella Hazen’s favorite sauce. I’m planning on sharing with my sister! Thanks so much! I’m going to totally enjoy all of it.